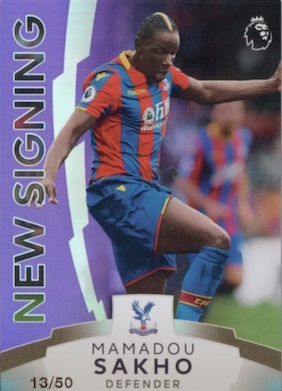 A new choice for EPL fans, 2017-18 Topps Premier League Platinum offers some of the most exciting stars from the sport. Each mini box contains an autograph, with two per master hobby box. Collectors can expect a suggested retail price (SRP) of $50 per mini box, $100 per master box, and $1,200 per case. Displaying the player name using larger text, 2018 Platinum Premier League features 100 cards in the base set, including five subjects from each of the 20 teams. The foil-enhanced cards work with added splashes of color for the Green (#/100), Purple (#/50), Orange (#/25), Red (#/10) and Holographic Foil (1/1) parallels. Card backs reveal "in-depth biographies" for each player. 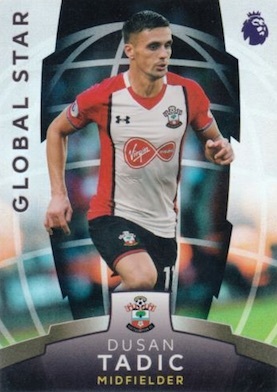 The 2017-18 Topps Premier League Platinum checklist also highlights notable names with a trio of themed inserts. Global Star (40 cards; 1:4 packs) identifies two international standouts on each team, while Icon (20 cards; 1:6 packs) cards are for every club's truly elite player. Paying close attention to the summer additions are the New Signing (20 cards; 1:4 packs) inserts for all 20 teams. Parallels for these sets include Purple (#/50) and FoilFractor (1/1). 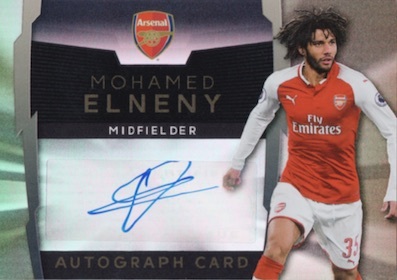 Promising one certified Autograph Card per mini box, 2017-18 Topps Premier League Platinum pairs some of the biggest names with a signature. Limited parallels include Green (#/100), Orange (#/25), Red (#/10) and FoilFractor (1/1). There are also Shirt Relic inserts featuring player-worn jersey swatches for league stars. PARALLEL CARDS: Green #/100, Purple #/50, Orange #/25, Red #/10, Holo Foil 1/1. PARALLEL CARDS: Purple #/50, FoilFractor 1/1. 25 cards. 1:7.4 packs. Shop autographs on eBay. PARALLEL CARDS: Green #/100, Orange #/25, Red #/10, FoilFractor 1/1. 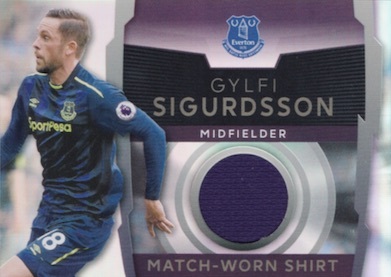 Good: Affordable EPL brand; simple lineup could be appealing to set collectors. Bad: Base design is a bit busy; pretty weak list of signers; some QC/printing issues. 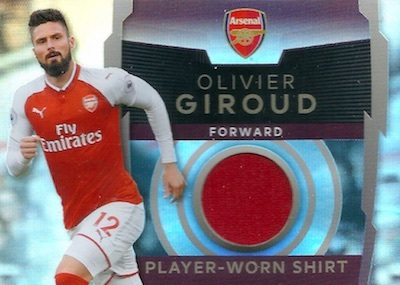 The Bottom Line: The Premier League Platinum format immediately calls to mind the 2017-18 version of Premier League Gold, and that is not exactly a good thing. Unfortunately, it comes across as a watered-down product and the autographs don't provide enough potential to offset the risk. 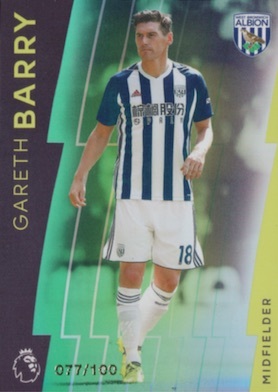 While the base look is choppy, I do like the design better than Premier League Gold. 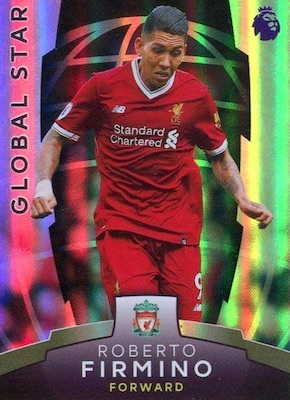 The three subset/inserts (Global Star, New Signing, Icon) are more simple and essentially the same style except for the card title. I appreciate the shine on all the cards and it really has a nice look in-person. Parallels are subtle but still not hard to spot as they are serial numbered on the front on the card to go along with the extra color. Lastly, there are autographs and relics of one similar design, and nothing else. Frankly, the design elements are minimal here with the reflective finish being the main attribute. One thing worth pointing out is that some stage in the printing process or pack-out clearly ran into some problems. Several cards in the review box were either peeling or had a sticky substance on the back. 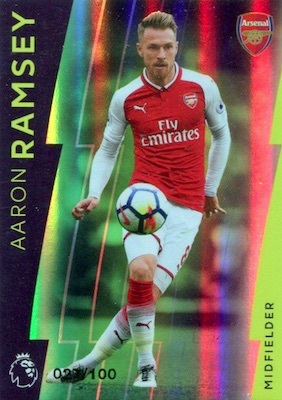 I do still find it odd that 2017-18 Topps Premier League Platinum went with one main numbering for the base and inserts but it's not a problem for me as a collector. The much bigger problem is the autograph checklist. 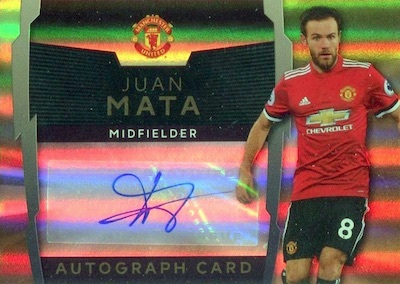 Although there are some solid names, most of the big EPL stars are not available and that can spell trouble when you are dealing with a release that relies on the two autographs per box to deliver nearly all the interest and value. Former United player Eric Cantona is the only big-value option to be found. Even in the $70+ range, these are a tough sell as far as value. When you can look at the checklist and purchase almost any card for less (in many instances, much, much less) than the box, there is virtually no incentive to open a box. Otherwise, you are just hoping for a low-numbered parallel or Cantona autograph. 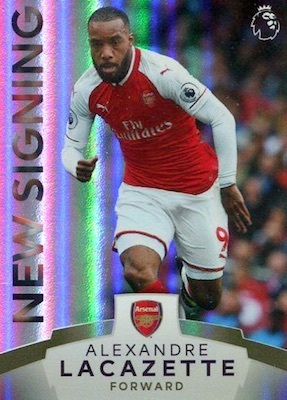 While the design is better, 2017-18 Topps Premier League Platinum is just another version of EPL Gold. The main redeeming quality for me is the Platinum finish. The review box was also missing one of the guaranteed autographs, which stinks. I've not heard anything to indicate this is widespread, but it's good to be aware of that possibility. With the delay and all, you would think they could get some stars to sign?